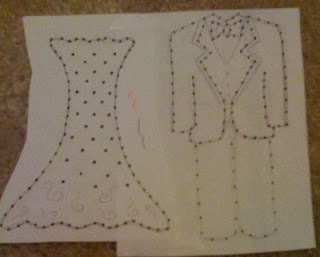 This is a picture of the pattern I made for an embroidered card. I gave it to my sister last night at her engagement party. I really meant to take a picture of the finished card so I could show you how it came out, but I forgot before I sealed up the card. Then I forgot again after she had opened it last night. The dress was white with one strand of pink embroidered in for a touch of color, and the tuxedo was black, white and gray. I'm hoping she'll snap a little pic to share with me... then I can pass it on to you guys! Now its back to my other 101 projects! Hope you are having a wonderful weekend!